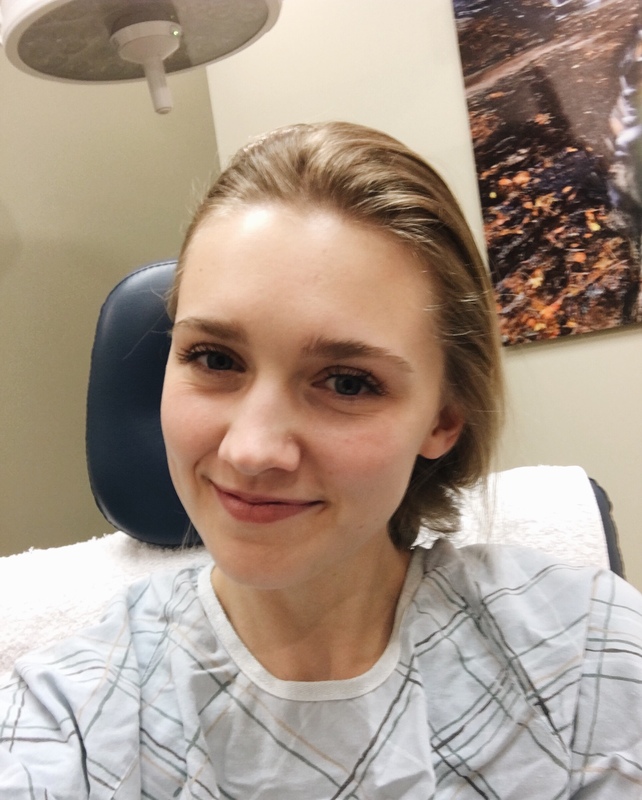 To update friends and family and to raise awareness of skin cancer, I wanted to share my basal cell carcinoma skin cancer experience here. To give you some background about me, I have fair skin and medium blonde hair. Growing up, my dad had red hair and fair freckled skin. My mother has dark brunette hair and olive skin. My skin is a mix of the two. Growing up my mother was very vigilant about applying sunscreen on us children. As a teenager, I would often apply a daily moisturizer containing broad spectrum SPF. As a grade school athlete, I would always wear sunscreen, hats, and protective clothing (covered shoulders and chest) when practicing and competing outside. I have never fake baked in a tanning bed, despite invites from others to do so. There are a very small handful of times where I have laid out in the sun. Obviously, that wasn’t the smartest thing to do, although, I always covered my face and never was severely burnt. I never was one to sunbathe by pools at friend’s, family’s, community’s, or hotel’s pools. I felt like I was always the one wearing sunscreen, a hat, and a sundress while sitting in the shade. A couple of times in my life I have had sunburns, but it was never anything too severe. I never had any sunburns that caused blistering or major peeling. Since graduating high school in 2010, I’ve been very vigilant about skin protection. I have even received a comment that I must not get outside much because of my paleness. I proceeded to tell that person that although I get outside, I try to take the proper precautions to prevent skin cancer because I have a strong family history of it. Both of my grandfathers, several of my uncles, and my dad all had skin cancer primarily on their faces. Most of their cases were basal cell carcinoma, however, some of the skin cancer cases were melanoma. About three years ago in 2015, I thought it would be a good idea to get a dermatology skin check to make sure I didn’t have any irregular spots or moles, which would show skin cancer. No issues were found at that appointment. As I was approaching my 26th birthday this year on February 6th, I needed to use up some cash that I had on a health insurance card. I used that money on a specialty office visit copay to get another skin check at the dermatology office. I scheduled a skin check the day before my 26th birthday, on February 5th. I showed the dermatology nurse practitioner a couple of spots I thought we should keep an eye on. I had a mole on my back that was irregularly colored. I also had a new growth in the crease of my nose on the left side. It was a recent growth since having my son in March of 2017. I thought it was either a new mole or a molluscum contagiosum lesion. My daughter had recently healed up from a severe case of molluscum contagiosum that transferred to me. Luckily though, I only had a minor case. At the appointment, the dermatologist took two biopsies, one from the mole on my back and the other from the new growth on my nose. While the mole on my back was two different colors, the spot on my nose was a pink shiny bump. The nurse practitioner notified me that they would call me and report the findings of the biopsies. I received a call from the office a week after my appointment to tell me that the nose biopsy came back positive for basal cell carcinoma. I was very surprised, as I mentioned before, I have been very careful about not damaging my skin. When I told my husband, he told me that he didn’t know of anybody else who was more careful about skin protection than I.
Basal cell carcinoma is a common skin cancer that is slow-growing. It is rare that it metastasizes and is removed through surgery and other medical treatments. Although it’s not urgently life-threatening, it should be treated promptly. I have a Mohs surgery scheduled for February 24th, however, my family and I want to consult with a trusted plastic surgeon we know to make sure we are proceeding in the best possible way to get cancer removed from my face. The surgery date might change. I cannot stress enough how important it is to protect your skin to prevent sun damage and skin cancer. I highly recommend getting skin checks by a dermatologist to check your skin for issues. I will continue sharing updates on my plans for skin cancer removal and plan of care. Throughout this whole ordeal, I am reminded how blessed I am to have such a supportive family. Trials such as these put things into perspective. My family and faith in Christ are of the utmost importance. May we all realize that we are all fighting secret battles. Know that you could be an answer to somebody’s prayer. Reach out to those in need and you will be blessed. If you have any questions, please ask them in the comment section and I would be happy to reply.